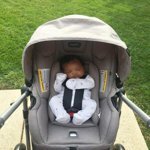 The Evenflo Pivot™ Modular Travel System featuring the SafeMax™ Infant Car Seat and SafeZone™ Base. The SafeMax Infant Car Seat features an Anti-Rebound Bar that limits the amount of rebound movement experienced in a frontal-impact. The SafeMax Infant Car Seat is also Rollover and Side Impact tested; designed to help protect during a side impact crash or rollover. Integrated belt lock-off system provides peace of mind that the base is securely and correctly installed. The SafeMax ICS has been designed and tested for structural integrity at energy levels approximately 2X the federal crash test standard AND tested to simulate a side impact event and rollover event. The Pivot™ Modular stroller offers a multi-position modular frame with 6 modes of use! 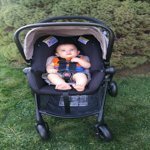 The stroller converts easily from an infant car seat frame stroller to stroller seat and carriage mode. Each mode, baby can face in or out and is easily adjusted. The carriage mode is perfect for infants and offers a cover for chillier days. The new Cruiser Tires have a sleek look and the over-sized rear wheels provide an easier ride. 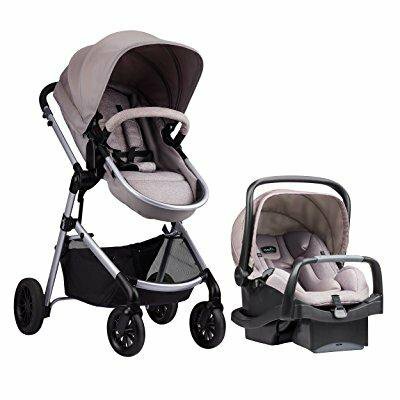 The full coverage canopy, convenient in-seat fold, large storage basket, Flex-Hold parent cup holder and ergonomic handle offers all the features needed for parents! The SafeMax™ Infant Car Seat has a full canopy and comfortable infant insert pad. Baby can ride in comfort as this car seat base has a 4 position recline. 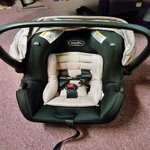 Parent can easily install the Infant Car Seat base with the 2 Step Lock Off feature. Ready, set, go – car seat moves from base to stroller with one secure click. The unique ergonomic handle is designed for carrying in the bend of the arm, exactly how most parents carry it. Infant Car Seat: Accommodates children 4-35 lbs. 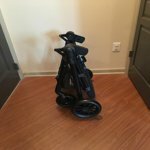 Absolute must have travel system! 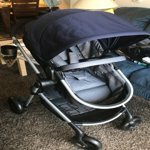 I absolutely love this travel system! It's so easy to use and I especially love that I can use it for both my newborn and my toddler. It's a breeze to change from the bassinet setting to the toddler setting. I also love how sharp this looks! It moves wonderfully and can travel well on many different terrains. The car seat is super sturdy, yet comfortable. 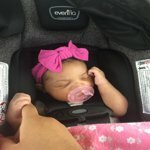 My daughter loves being in it whereas she hated her other carseat. I would say that this is definitely a must have travel system and I really wish that I had this when I had my first child. 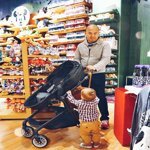 My fiancé and I purchased this travel system for our son when he was 3 weeks old and we instantly fell in love with it! He is now almost 4 months old and every time we use it we always say “this is the best purchase we ever made”. 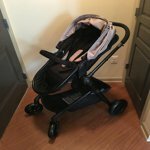 The stroller is very lightweight and moves effortlessly! 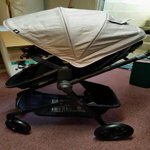 The bottom basket is big, and the car seat clicks into the stroller easily. 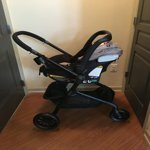 We love that we have the option to use the car seat or the bassinet with the stroller! 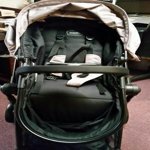 I was given this travel system as a gift and my baby falls asleep every time she is put into the car seat for a car ride or during walks in the stroller. Friends have said it's the "Cadallac of car seats". The padding in the car seat gives me comfort that she will be safe. 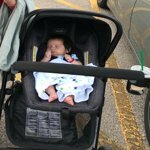 The big wheels on the stroller provide a smooth and easy ride for me and the baby. 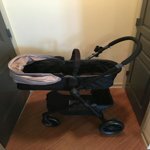 I highly highly recommend this travel system! 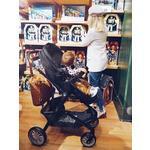 I loooove Pivot Travel System so much!! 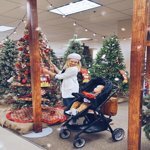 I loooove Pivot Travel System so much!! !We chose this stroller for many reasons. First, it has a large basket that can easily fit a lot of staff, not only my bag. 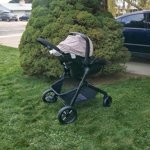 Second, the stroller is very maneuverable and light enough. In addition, I'm delighted with how quickly and easily you can turn the seat into a bassinet. Such a great choice for my little Benjamin! Highly recommend! 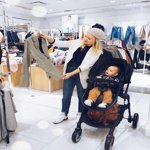 I cannot rave enough about the pivot travel system! 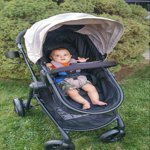 The wheels are perfect for all the running around I do with my 4 month old and he is so comfortable in it. I love the look the all black with a touch of dark grey perfect for my style! 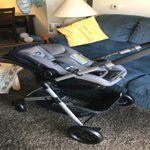 I had purchased another stroller during pregnancy and 2 months in I was having so many issues with it I decided I had to make a switch. Well I am so glad I did! 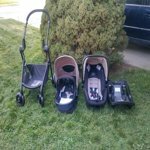 its so easy and hassle free to pull out of my trunk and put away as I'm usually by myself with the baby. And the basket is amazingly spacious! Lots of shopping can be done with it. The only negative thing I have to say about this stroller is the cup holder is not secure at all and as the stroller moves it will tilt eventually spill your drink if you're not adjusting it and watching it constantly. But I can live with that! I won't be actually using this until July, that's when I'm due. So I gave it 4 stars because I did get this on a great sale and overall I think it's really cute for the money. Plus I liked the sensor safe option for car seat. I will say the wheels look really cheap. It's kind of a shame bc I think this would be a really great set if Evenflo would upgrade their wheel game. I read about the wheels from others as well. 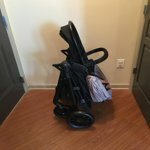 Can you use a stroller board with this stroller? 1. The Pivot Modular does not accept a riders board. 2. The Pivot Modular stroller is not compatible with a riders board. 1. The Pivot travel system maximum weight is 50 pounds. 2. The maximum weight for the Pivot Modular is 50 pounds. 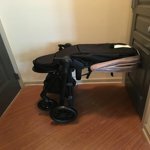 How do you get the piece that cover the legs for the stroller seat? 1. Certain models will come with the foot muff, which is the Pivot in the Casual Gray and the Sandstone fashions. 2. Only certain Pivot models will come with the foot muff, which would be the Pivot in the Casual Gray and SandStone (US models only). Warranty Information:For a period of 90 days from the original purchase of this Product, Evenflo warrants to the original end user ("Purchaser") this Product (including any accessories) against defects in material or workmanship. Evenflo's sole obligation under this express limited warranty shall be, at Evenflo's option, to repair or replace any Product that is determined to be defective by Evenflo and determined to be covered by this warranty.